If you’re looking for an award-winning minivan that is family-friendly and designed for maximum passenger space, start shopping for the new Chrysler Pacifica for sale in Homestead at Spitzer. As your preferred Chrysler dealership in South Florida, we have an amazing selection of new Pacificas available on our lot right now, just a short drive away from Miami, Kendall, and Pembroke Pines. Click on any our available Pacificas below to get information about pricing, specs and tech add-ons for each specific vehicle. If you plan on trading in your current vehicle, please let us know, we can help you get an initial valuation on your trade-in. Contact us when you’re ready for a test drive! Why is the Pacifica such a popular minivan for Homestead & Miami area drivers? An available 360° Surround View Camera makes backing up and parallel parking easier and safer than ever. The Uconnect Theater redefines family entertainment by giving you available dual 10-inch touchscreens, dual HDMI inputs, wireless headphones, and Apple device compatibility to keep you connected during long road trips. The Pacifica is the only minivan in its class to feature the Stow ’n Go® Seating and Storage system, designed to provide superior extra storage space. When you’re ready to test drive one of our Pacificas, stop by our showroom in Homestead or give us a call to make an appointment. If you have any questions about buying vs. leasing a Pacifica, applying for a car loan, or want to see which Chrysler specials or lease deals you can apply for, contact us to get the processes started. 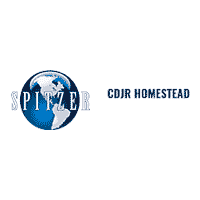 We look forward to serving you at Spitzer Chrysler Dodge Jeep Ram Homestead.